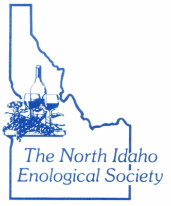 The North Idaho Enological Society (NIES) is a not-for-profit organization dedicated to increasing the knowledge, appreciation, and enjoyment of wine. Our tastings are held from October through April on the third Friday of every month at 7:15 p.m. at the Lake City Center in Coeur d'Alene. In addition, we enjoy a full dinner and tasting in May. The tastings are generally built around a theme and feature multiple wines chosen by the guest speaker, usually a winemaker or wine industry spokesperson.